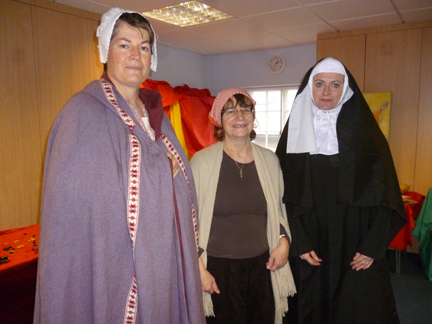 This event was based on the Church Schools of Cambridge event held in November close to All Saints Day. Saints and Pilgrims was held in the school rather than the church. The school has a variety of different sized group rooms, which were used to tell the different stories. We wanted the stories to reflect a variety of saints, experiences and times. The Church Schools of Cambridge told the stories of Bernadette, Julian of Norwich and Maximilian Kolbe and included the story of John the Evangelist in the introduction – a balance of men and women and including saints who were called as children. At our event we chose Francis instead of Bernadette as we wanted the contrast of a saint where something is known of their past life. For the first time these stories were told dramatically, in costume. Julian (and Bernadette) were told by the people themselves, Francis of Assissi by St Clare, and Maximilian Kolbe by Janina, wife of Franiszek whose life had been saved by Maximilian in Auschwitz. After the introduction the groups rotated around the different stories. We talked about what it means to be a saint, making it clear that this is about holiness rather than goodness, and showed pictures of a variety of saints including Mother Theresa, Simeon Stylites and Oscar Romero. We also talked about pilgrimage, a journey to a holy place that allows people to come close to God, reflect on their lives, enjoy creation and meet new people. "Journeys are different to different people. I wonder what the journey will mean to you? In the olden days pilgrims used to wear special badges to show they were on a holy journey. The shell is still a symbol of pilgrimage. As you go, you can take a shell in a little organza bag." Julian's cell was set up in the small window less library. We did it very simply - we covered the books with white, beige or hessian cloths. To set the scene we had a breathing model cat (! ), a small cross, and a tray with quill, ink and parchment. Children at church had painted a window looking out over her garden and another window showing the altar in the church, as seen by Julian through the squint. Julian talked about her life growing up in Norwich, a city devastated by the Black Death, and her own illness when she was thirty. She spoke of her "showings", her book "Showing God's Love" and how God had once shown her a small nut "all that there is". She finished by speaking of her life as an anchoress, dedicated to praying for the suffering of the world. I wonder if you have a special place where you go to be quiet and think? I wonder what you would miss most if you lived a simple like alone, like me? The children were given the opportunity to decorate anchor shapes to remind them of Julian the Anchoress. There were also a collection of hearts which each group arranged on a black cloth. We set this space up to show the contrast between the before and after of Francis' experience of God - the wealthy and the simple. One side of the room was hung with rich velvet and scarlet and purple cloths. (Francis father was a rich cloth merchant.) We added gold coins and shimmer stones. In contrast, the other side wase draped with black netting and hessian. Small birds and greenery were added to give the effect of simplicity and the natural world. St Clare told the story of Francis using pictures. She started with his party loving youth and his imprisonment and then went on to talk of his experience of God in the ruined church of St Damiano. His life changed to that of a travelling friar, caring for the poor and sick and rebuilding churches. He lived with a joyful simplicity that brought him many followers. I wonder if we can leave any part of the story out and still have all the story we need? I wonder why people listened to Francis and came to join him? The children were invited to take a creation symbol and place it somewhere in the room to symbolise Francis' love of creation. These were cut outs of suns, animals, trees etc stuck onto lolly sticks that we had previously used at a crib service. They were also given the opportunity to thread beads on elastic to remember Francis' friendship to all and to use the blocks and citiblocks to build churches. The old computer suite (now a group room) had bars on the window which helped give the impression of a prison cell, now a chapel - the chapel of Maximilian Kolbe in Auchswitz. We kept this area very simple with a couple of screens covered in black material to cut down on the clutter. We also had a focus table with a cross,a picture of Maximilian with Mary and a candle. "This is the prison cell of Maximilian Kolbe. But you do not need to be afraid, it is not a prison cell now, it is a chapel" were the words we used to greet the children at this session. Janina, the storyteller, began with Maximilian's childhood and then spoke of his vision of Mary and her offer of two crowns - the white one for serving God and the red one for martyrdom. Janina continued with his life as a Franciscan, the invasion of Poland, Maximilian's arrest and experience of Auchswitz before finally telling the story where he stepped forward to take die in place of Franciszek. "I could only thank him with my eyes. I was stunned and could hardly grasp what was going on… someone else willingly and voluntarily offers his life for me – a stranger. Is this some dream?" I wonder which part of this story you liked the best? I wonder if you have ever been afraid? I wonder what is the most special thing that somebody has done for you? I wonder if you have ever done something special for someone else? The storyteller had described Maximilian as a light in the darkness of the camp. The children were invited to place a battery candle in a dark place to remember this. They also chose different coloured wool to wrap round sticks - they were given the choice of white, red, black and purple. After coming back together the children continued in three groups and rotated around the activities. One group had the opportunity to do sand art - filling small bottles with different coloured sand. The second group were given black card silhouettes of saints and a variety of collage materials to use with them. The final group had a drink and a biscuit and then chose five little things (for example an anchor for Julian, a bird for Francis and a crown for Maximilian) to take away to remember the stories. We finished with a short prayer. We had not been sure how well the event would work in the school as previous events had been held in the church. However it worked much better than we expected - and a couple of members of staff even commented on the peaceful atmosphere in Julian's cell! The main problem was cutting down on the clutter, which we did by using screens and cloths. This was the first non Biblical theme we had used but we found the children responded very thoughtfully to the stories. We had wondered if the story of Maximilian's death might be too difficult an issue for them and had simplified the story to avoid details as to the manner of his death. However every group was gripped by his self sacrifice. Many children responded with their own fears; interestingly several mentioned possible world war and the election of Donald Trump as president, clearly reflecting anxieties at home. Arranging the hearts at the Julian station was a favourite activity; it often seems that offering three dimensional materials allows even inartistic children to express themselves creatively. The main difference between the two events was that the Cambridge Church Schools event used the story of St Bernadette instead of St Francis. Bernadette was chosen to show that someone whose visionary encounter took place during childhood and also to provide a balance between male and female saints. Bernadette's grotto was set up using a gazebo covered with black cloths. Inside were two LED "trees" - one was left bare while the other was hung with artificial greenery. A paddling pool with a sprinkler was used for the spring, and blue cloths were used to make the river. Mary's staue was placed above a rose bush. The story was told by Bernadette herself. She began with the children sitting around the darkened grotto and talked about her early life as a shepherdess. When she spoke about her vision of the beautiful lady all the tree lights were switches on, as well as a spotlight on the staute of Mary. The change from dark to blazing light created a real "wow" moment for the children which was repeated when the storyteller told about finding the spring of water and the sprinkler was turned on. Bernadette also spoke about how hard it was for adults to believe her story, especially as she was a child. I wonder if something special has ever happened to you? I wonder how easy it is for children to get adults to listen to them and believe them? I wonder what adults would hear if they listened more to children? The children were invited to make prayer bracelets using beads and elastic - they chose beads to represent things that were important to them. They could also place a stone in the water to represent something they wanted forgiveness for and make a pathway using a variety of stones. A variety of shoes were placed around the font as a focus on the theme of pilgrimage, a holy journey. As the church used was St John's we used a wooden figure of a fisherman and included him in the saints mentioned in the introduction. A small area at the back of the church was screened off. We added: a basket of fruit and bread, a tray containing a parchment scroll, inkwell and feathers, an old looking book, Julian's cat, candles, cross, a bowl of acorns. To one side was Julian's garden, created by using greenery, flowers and two garden obelisks. To get into the "cell" the children were asked to step over a threshold made by draping hessian over kneelers. As we used a side chapel for this station, it needed only minimal setting up. All we did was add a cross, candles and flowers. "Greater love hath no man than this... that he lay down his life for his friend"
After the creative response of sand art and decorating saints, and choosing five little things to remember the event the children re-gathered around a compass mat. Here they were led in prayer before being given a candle to take away for their classroom.